We offer many types of indoor graphics and signage. From typical to custom banners as well as large window and wall coverings. We have many types of products and designs to choose from. The options are broad and the varieties are endless. Almost any creation you can dream of - SightLine can accommodate your ideas and transform your interiors with eye catching / color popping designs. These are just a few of the typical applications for the products we can produce. There are many uses and possibilities for indoor graphics. To see some of our past projects please visit our gallery. We are always open to new creative ideas and designs for showy and impressive interiors. 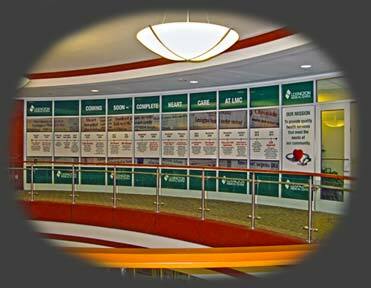 From mounted signage, window and wall graphics, banners or custom floor and ceiling graphics - SightLine can get it covered. Feel free to call us to discuss any needs you may have or speak with one of the designers to come up with a design that will stand above the rest.